December 11th from 1pm until 6pm Stop in and see the studio! We have lots of awesome prizes, raffles, and booking specials. Also, Your chance to shop www.vegaspinups.com merchandise in person! Our Santa sessions are already all filled up but don’t let that stop you from coming by and saying hi! We have so many amazing events and specials for the new year too. Everything is filling up so quickly so don’t miss your chance. Starting in January Pinup Cortney Maylee my BFF will be coming for a weekend of fun. 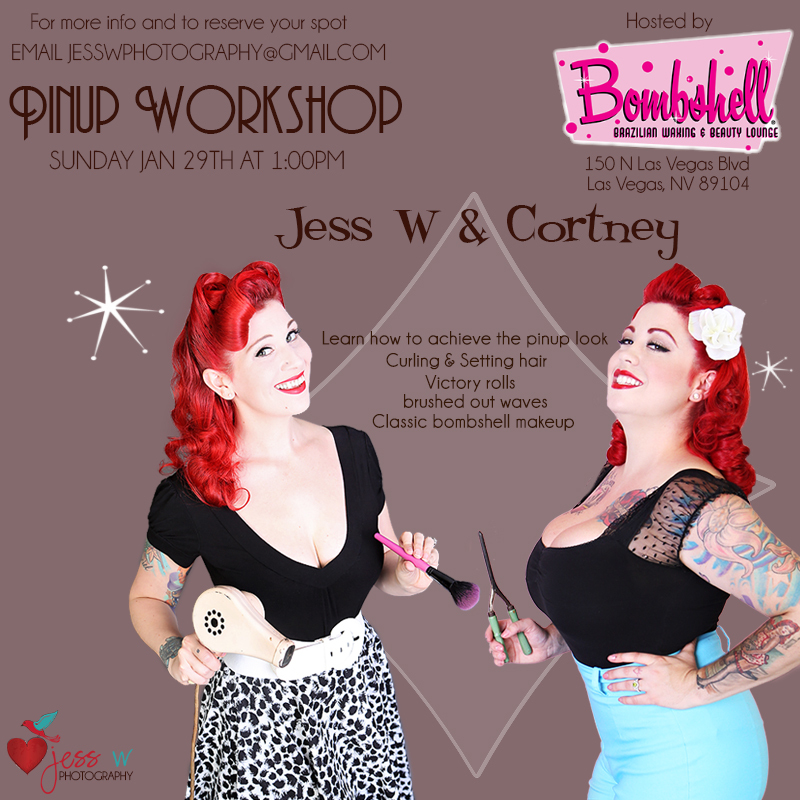 We are teaching our Pinup workshop hosted at the amazing Bombshell beauty Lounge here in Las Vegas! We are also doing a day of photo sessions at the Jess W Photography Pinup Studio with hair and makeup by Cortney and Photos by yours truly. Just in time for Valentine’s day gifts! You can choose from 3 of our one of a kind sets to shoot in. In the Cincinnati area and feel like you’re missing out? Don’t worry, I am coming for all of you fabulous ladies in the spring! Cortney and I will be hosting TWO full days of shoots. Spots are already filling up for these quickly, so why not treat yourself for the holidays or let that special someone know this is the gift you have been dying for! Would you like more info or are you ready to book? Email me at Jesswphotography@gmail.com and I will get you all set. Hope you all have wonderful holidays with your loved ones. 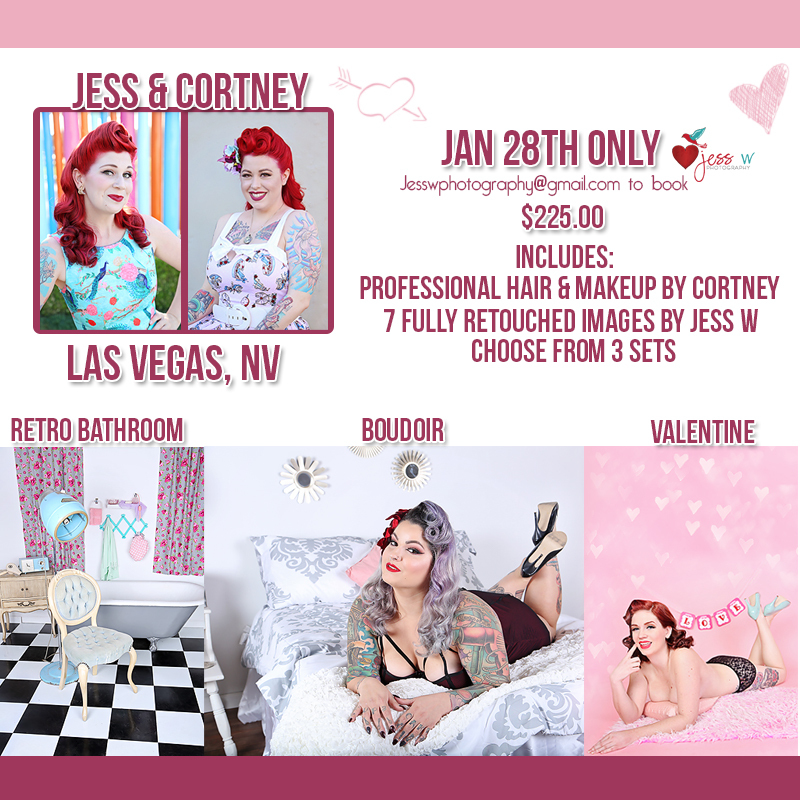 So excited to announce the opening of our Brand new Jess W Photography Pinup studio location in Las Vegas, NV. We have Brand new sets, props, and a vast array of wardrobe. Professional Hair and Makeup, use of wardrobe/wardrobe assistance, and posing assistance is provided with all of our sessions! Get the full pinup experience. Ask about our pinup photo shoot parties and pinup pamper parties! Do you follow us on Instagram? @jesswphotography Check out our 10K follower giveaway! Tag a friend for your chance to win! The Mustard blossoms halter tie swing style dress is an eye catcher. Pair it with a Cardigan or bolero for an adorable fall look! The pops of blues and purples against the mustard yellow background are a colorway dream. The smocked back along the entire bodice allows for plenty of stretch. Making this dress super comfortable and allowing a flattering form fit. With a full circle skirt and mid length cut there is plenty of room for a petty coat if you wish and of course lots of twirls! Just $39.00 plus shipping. These Crop Peasant tops are the perfect pairing for all of your circle skirts, capris, and high waisted pants! The sleeves can be worn on or off the shoulder making this super cute top even more versatile. The smocked waist band allows plenty of stretch while still giving a flattering waist shape. What a steal these tops are at just $20 plus US Shipping! Love the skirt? Order your haunted mansion skirt HERE today! Available in Small, medium, and Large. The bust in these tops is very open and the waist stretches at least 4-5 inches more than the listed measurements. This polka dot vintage inspired dress is available in several colorways. This is definitely a dress you’ll love to own in several colors. The bodice is a gathered peasant style with shirred piping along the scoop neck and perfect cap sleeves. The waist band is thick and smocked for a very flattering look and provides a nice break in the pattern. A true fit to flare style with a full circle skirt and lovely ruffled mermaid hem. The length of the dress sits just below the knee to finish off the classic pinup style. At just $39.00 and $4.95 in the US these dresses won’t last long! Order yours today! Available in Small, Medium, and Large. Order your HERE today on www.vegaspinups.com! © 2019 JessWphotography|ProPhoto theme by NetRivet, Inc.